The Mosque has been open 365 days a year for the five daily prayers. We have 100-200 people attend on average for each prayer through which they have been fulfilling their spiritual needs. Also the imam makes himself available for advice and consultation after each prayer. Every Friday the Mosque is open for the Jummah prayer. On average 1500-2000 people attend including children and women. A sermon is given to encourage people to be a responsible and caring Muslim and to participate locally to create social harmony; this is followed by a congregational prayer. The two Eid prayers were held in the Mosque; Normally 4 Jammah takes place; approximately 4000 people attended each Eid prayer including children and women. During the month of Ramadan, approximately 800 people attend the Tarawih prayers each night. The Mosque has been a place of education and learning for the local community. 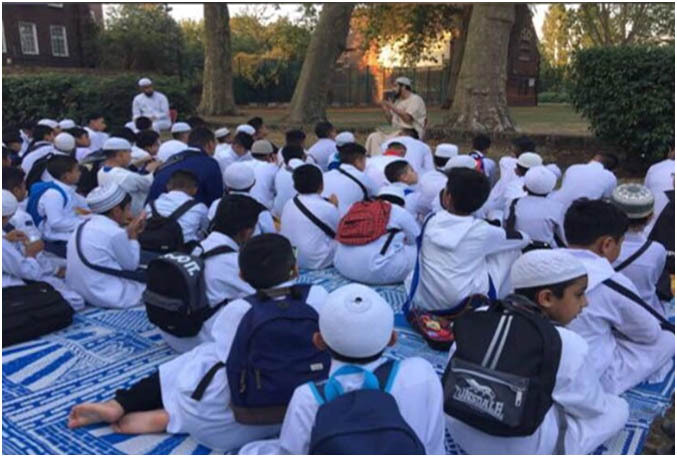 Almost 200 pupils are taught a wide range of Islamic subjects from Monday to Friday for two hours each evening. The Mosque provides prayer facilities for women for daily prayer, Jummah, Eid and Ramadan. The organisation provides counselling and education support services for women. Women’s Link Project, which works with isolated women to address social and welfare issues such as domestic violence, mental health, parental skills etc. The Mosque is open for five daily prayers, Jummah, 2 Eid prayers and Tarawih in Ramadan with a small separate prayer facility for women. Other activities include children’s (boys’ and girls’ classes) evening and weekend Islamic school for maktab, hifz and pre-alim and alim classes (Currently 260 children, 20 male and female teachers are in both evening and weekend Islamic school), regular Tafseer session, Qur’an learning session, Arabic language classes and sessions regarding health, Islamic and social activities for men and women. Sessions are also open to non-Muslims to raise awareness of Islam and to promote social harmony amongst different faiths. The facilities for prayer and Islamic education for children and adult are arranged according to the Qur’an and teachings of Prophet Muhammad(S). Initially, worshippers were primarily of Asian descent, however as the local community became more diverse, so did worshippers. Now those who attend the mosque range from Asian, Arabian, African and European origin. The mosque has grown to be a place of worship which welcomes all Muslims, regardless of their background. The mosque aims to accommodate everyone within the needs of UK law. Though this organisation was originally set up by a local people of Bangladeshi ethnic origin, however, responding to population growth and local demographic profile, membership has been offered to Somali, Arab and other Muslim communities. Services are accommodating per the needs of all service users. Membership is also extended to women, young and people with disabilities. Current services are for wider community as well.